I always look forward to coming back to Kettlebaston. 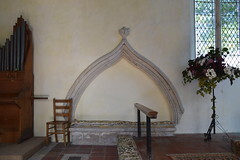 It is likely that anyone who knows the churches of Suffolk well will have Kettlebaston among their favourites. The setting is delectable, in the remote Suffolk hills between Hadleigh and Stowmarket. The building is at once elegant and interesting, the interior stunning, but most fascinating of all, perhaps, is the story behind the way it is today. In 1963, in the thirty-third year of his incumbency as Rector of the parish of Kettlebaston, Father Harold Clear Butler sent a letter to a friend. "You are right,"he wrote. "There is no congregation any more." In failing health, he relied on the family of a vicar who had retired nearby to carry out the ceremonies of Easter week that year. In 1964, Father Butler himself retired, and an extraordinary episode in the history of the Anglo-Catholic movement in Suffolk came to an end. 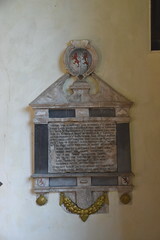 There may have been no congregation, but St Mary at Kettlebaston was a shrine, to which people made pilgrimages from all over England. 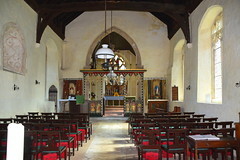 Here was the liturgically highest of all Suffolk's Anglican churches, where Father Butler said the Roman Mass every day, celebrated High Mass and Benediction on Sunday, dispensed with churchwardens, flouted the authority of the Anglican diocese by tearing down state notices put up in the porch, refused to keep registers, and even, as an extreme, ignored the office of the local Archdeacon of Sudbury. An entry from the otherwise empty registers for October 2nd 1933 reads Visitation of Archdeacon of Sudbury. Abortive. 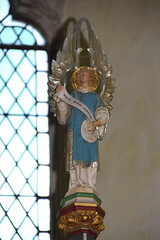 Archdeacon, finding no churchwardens present, rode off on his High Horse! Father Butler came to this parish when the Anglo-Catholic movement was at its height, and survived into a poorly old age as it retreated, leaving him high and dry. But not for one moment did he ever compromise. 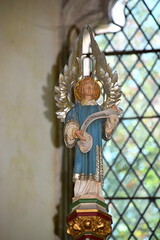 Kettlebaston church is not just remote liturgically. You set off from the vicinity of Hadleigh, finding your way to the back of beyond at Brent Eleigh - and then beyond the back of beyond, up the winding roads that climb into the hills above Preston. Somewhere here, two narrow lanes head north. One will take you to Thorpe Morieux, and one to Kettlebaston, but I can never be sure which is which, or even if they are always in the same place. Finding your way to this, one of the most remote of all Suffolk villages, can be like finding your way into Narnia. Once in the village, you find the church surrounded by a high yew hedge, through which a passage conducts a path into the graveyard. 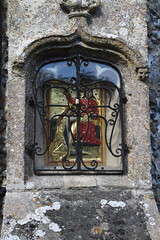 On a buttress, a statue of the Coronation of the Queen of Heaven sits behind a grill. It is a copy of an alabaster found under the floorboards during the 1860s restoration. The original is now in the British Museum. One Anglo-catholic tradition that has not been lost here is that the church should always be open, always be welcoming. You enter through the small porch, perhaps not fully prepared for the wonders that await. 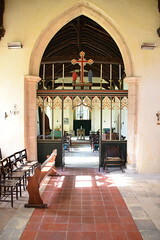 The nave you step into is light, clean and well-cared for. There is no coloured glass, no heavy benches, no tiles. 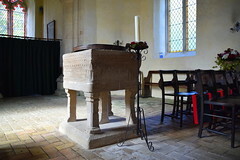 The brick floor and simple wooden chairs seem as one with the air, a perfect foil for the rugged late Norman font, and the rich view to the east, for the fixtures and fittings of the 20th Century Anglo-Catholic tradition survive here in all their splendour. 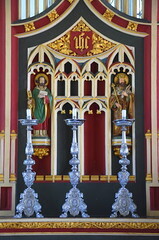 The two major features are the rood screen and the high altar. 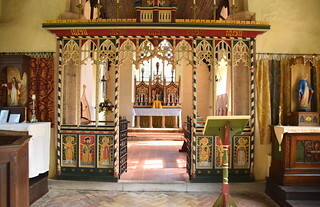 The rood screen is the work of several people, having been added to over the years by a roll-call of prominent Anglo-Catholic artists. 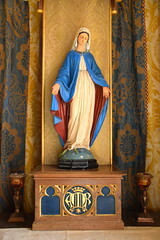 It was designed by Ernest Geldart in the early 1900s. It was painted by Patrick Osborne in 1949, apart from the figures, which are the work of Enid Chadwick in 1954. 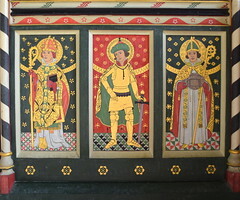 They are: St Felix as a bishop holding a candle, St Thomas More in regalia, St Thomas of Canterbury with a sword through his mitre, St John Fisher as a bishop holding a book, St Alban in armour and St Fursey holding Burgh Castle. 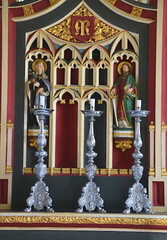 To one side, the Sacred Heart altar bears the original stone mensa from the high altar. 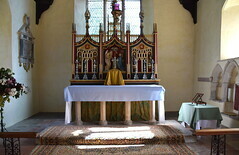 The table itself is the Stuart Communion table. 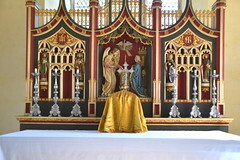 To the other, a Lady altar. All of these are either gifts or rescued from redundant Anglo-Catholic churches elsewhere. 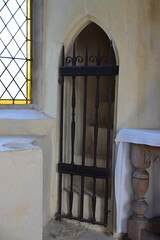 The elegant grill in front of the rood loft stairs is by Ninian Comper. 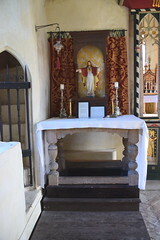 Stepping through into the chancel is a reminder of how the clearance of clutter can improve a liturgical space. Here, the emptiness provides a perfect foil for the massive altar piece. 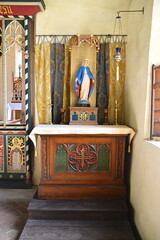 The altar itself was the gift of Miss Eleanor Featonby Smith, consecrated by the Bishop of Madagascar in 1956, in one of those ceremonies conducted in the labyrinthine underworld of the Anglo-catholic movement. The altar sports what is colloquially referred to as the Big Six - the trademark six candlesticks of an Anglo-catholic parish. 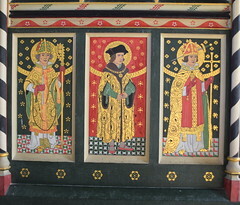 Behind them, the rich reredos is also by Ernest Geldart, and was also painted by Patrick Osborne. to veyle the lustre of thy name. till union make both soule & body blest. Yeeres thrice five hundredth ninety nine. And yet, you notice, we never learn her name. Above, the roofs drip with hanging paraffin lamps, the walls have their candle brackets, for this little church still has no electricity. You sense the attraction of Benediction on a late winter afternoon. 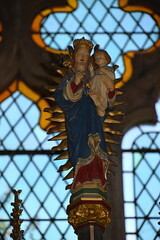 St Mary is loved and cared for by those who worship in it. There are rather more of them than in Father Butler's final days, but they are still a tiny, remote community. 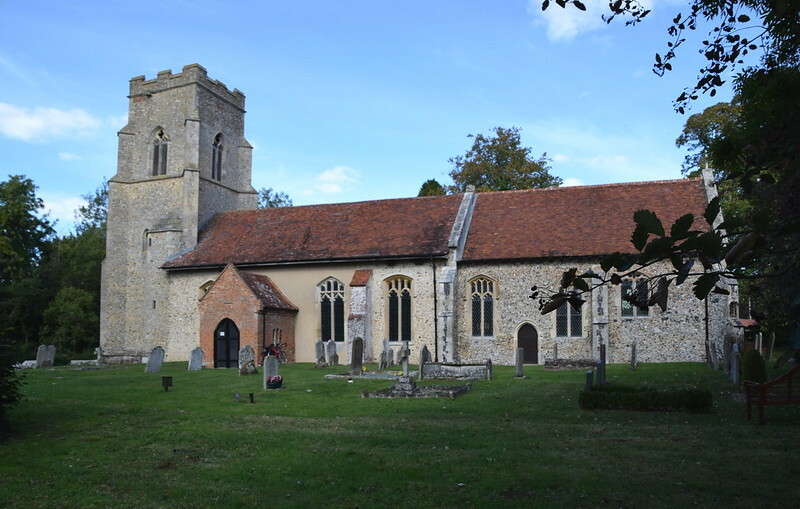 Since 1964, they have been part of a wider benefice, and must toe the Anglican mainstream line, as at Lound. 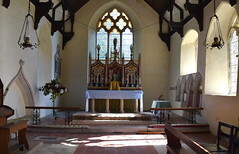 But also, as at Lound, the relics of the Anglo-Catholic heyday here are preserved lovingly, and, judging by the visitors book, it is not just the regular worshippers who love it, for Anglo-Catholics from all over England still treat it as a goal of pilgrimage. I remember sitting in this church on a bright spring afternoon some twenty years ago. I'd been sitting for a while in near-silence, which was suddenly broken by the clunk of the door latch. Two elderly ladies came in. They smiled, genuflected towards the east, and greeted me. Together, they went to the Sacred Heart altar, put a bunch of violets in a vase on it, and knelt before it. The silence continued, now with a counterpoint of birdsong from the churchyard through the open door. Then they stood, made the sign of the cross, and went out again. Father Butler looked on and smiled, I'm sure.